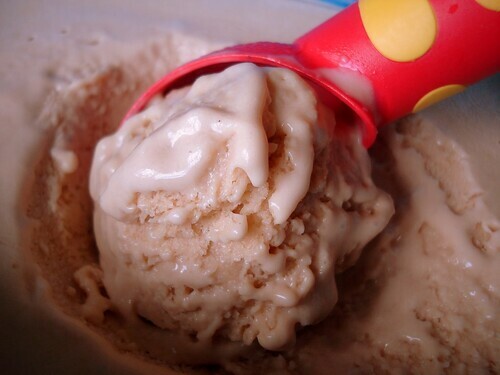 Creamy chendol ice-cream, originally uploaded by Camemberu. Gorgeous pictures on Amandalwh's blog inspired me to concoct my own ice-cream. No ice cream maker required! After a successful trial batch on plain vanilla, I decided to try a flavour I really like. Chendol! Well, technically, this should be called Gula Melaka-Coconut ice cream, since it contains none of the green noodle strips called chendol (which are a bit pointless to freeze since they become hard fiddly bits). But oh, who cares what it's called when one slurp makes you forget everything else in the world. 1. Beat egg yolks briefly until evenly mixed. 2. Combine palm sugar, salt, coconut milk and low-fat milk in saucepan over low heat, stirring until fully dissolved. 3. When mixture starts to boil, take it off the heat and strain to remove impurities. 4. Pour sugar-milk mixture into beaten egg yolks, stirring slowly. 5. Put it back on low heat until it thickens enough to coat the back of a spoon. Do not let it boil or the custard will harden. 7. Stir in cream and put it in the freezer for an hour. 8. Check the ice cream - it should have started freezing at the edges but not at the centre. Take the bowl out of the freezer and beat the ice cream mixture until it’s creamy once again (this breaks up the ice crystals that have formed). You could blitz it using a food processor or just give your arms a good workout. Place the ice cream back into the freezer. 9. Repeat step 8 for a total of 3 times at least. The more you repeat this, the softer your ice cream will be. 10. Pour the mixture into storage container and freeze till set. The final product has a consistency that's a bit more like kulfi than airy soft ice cream (that you get from the ice cream maker doing all the churning work for you). But it makes the dessert no less decadent. oooo.... nice! a few months ago, i was making home made ice cream too! i bought an ice cream maker for that hobby. i only used it for like 8 times. LOL. time to make more ice cream! oh ya, i like your ice cream scoop! nice! reminds me of the durian icecream my mum made when i was a kid. this weekend go back must remind her and thank her! I made some semifreddo last month. Not too bad, your method seems to need a lot of strength. Can I beat with mixer instead? Mmmm...yummy! That combination sures good. COOOLL!! Cendol is my favourite too and I think I will give it a try tomorrow. Thanks for sharing the recipe. K-man: omg you have an ice cream maker!!! so you made sorbets more? haha yes the IKEA ice cream scoop is so bright and happy. Southernoise: wow, real durian ice cream? Lucky childhood! Didally: haha, no need so much strength la. I barely mixed it for two minutes. Are you going to blog your semifreddo? LCOM, ocha: yes it is! wow thanks for the no-ice-cream-maker needed recipe! i always wanted to make my own ice-cream but didn't want to waste money on an ice-cream maker. looks yummy! can you show me the ingredients you use? you get your thick coconut milk fresh from wet market? what brand of the heavy cream are you using? But yes, coconut milk from wet market - fresh is always best. I've never liked the packet or powder types but in a pinch, I suppose you can use those too. I used Bulla Thickened Cream which is probably not ideal. But it's much cheaper and less fatty (35% fat instead of 48-60%) but note that it uses gelatine as a thickener, so it's not halal. I tried your recipe today, it taste really good. My nephew love it so much.